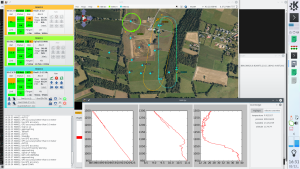 This is a first step of a hybrid IDS method based on the analysis of spectral traffic and a robust controller / observer for the estimation of anomalies in UAV networks. 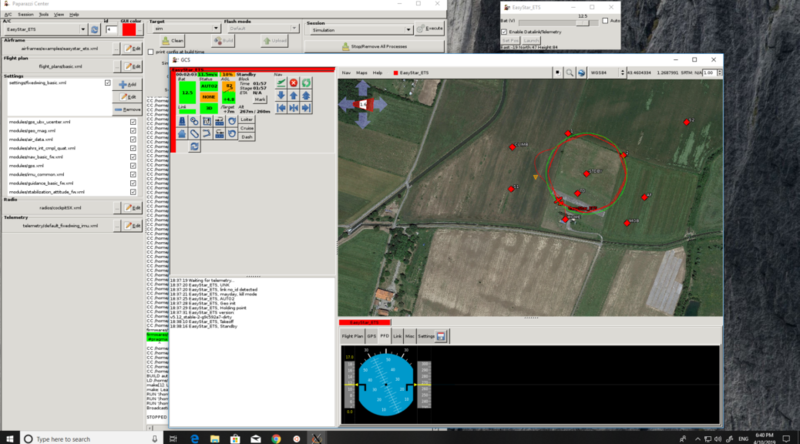 This module is currently designed to observe the traffic between the drones and the Paparazzi GCS. It provides a statistic signature of the traffic which can later be used to determine the nature of the traffic. The module is tested in face of a DoS attack and the results are very promising! The Paparazzi team is proud to announce a release of an encrypted version of pprzlink. The new secure Pprzlink uses a strong and fast cipher ChaCha20 with Poly1305 authenticator. 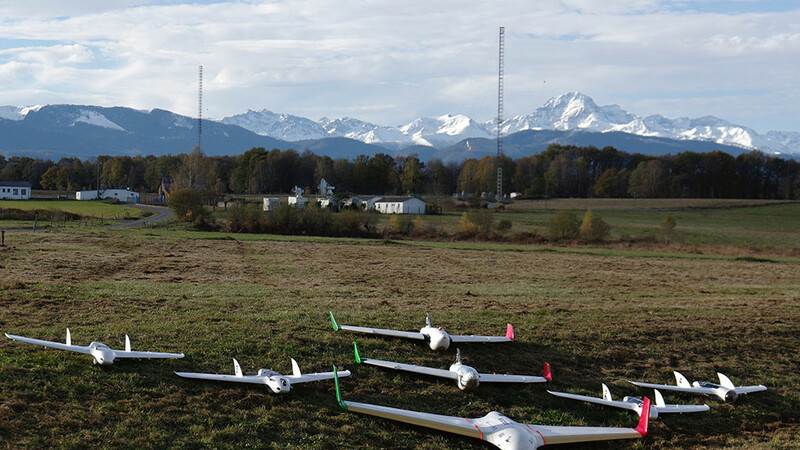 For better security and user convenience, a variation of station-to-station key-exchange protocol is implemented, to allow seamless key-exchange between the UAV and the GCS. Secure Pprzlink is backed by a formally verified cryptographic library HACL* (yes, the same library that is a part of new Mozilla Firefox). Why should you care? 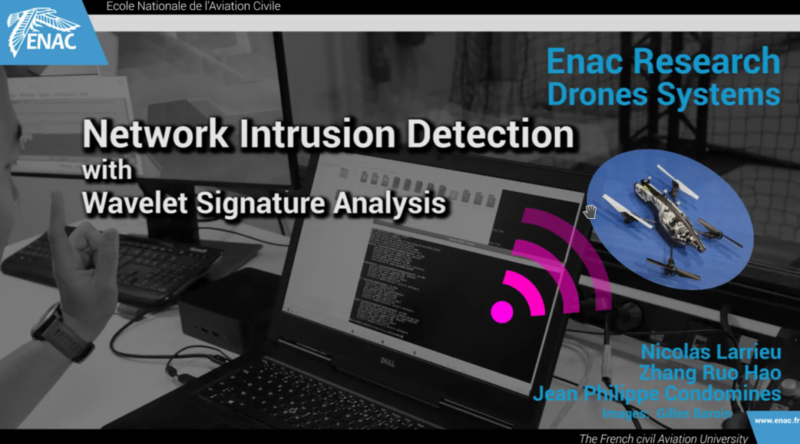 Without encryption, anyone can listen to your drone communication, and can potentially send modified or outright “fake” commands to it, steering it of course, or causing it to crash. Using encrypted radio link is similar to using encrypted connection on internet, and should be a common practice. How to use it? We prepared a wiki page with instructions and examples. In short, choose a secure link as your mode of communication when building the autopilot code, and the rest is handled automatically. Also, the GCS part of secure pprzlink is written in Rust, which is a memory-safe language, which guarantees that the code written in Rust is itself memory-safe and thus eliminates a large amount of possible software bugs. 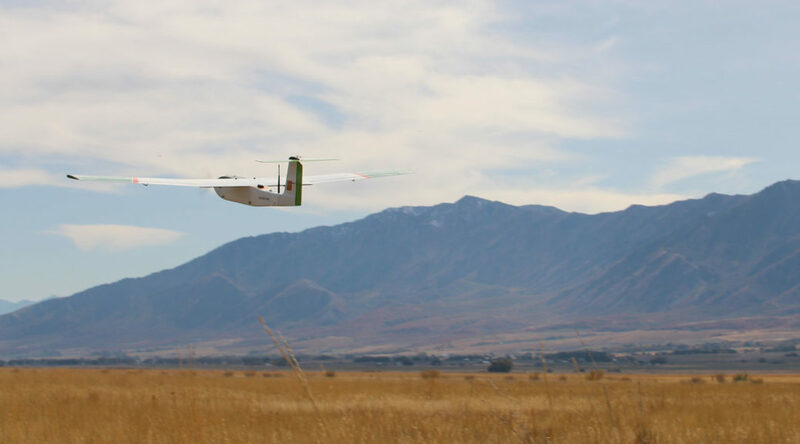 Secure Pprzlink was created with the help of Galois, Senman and is currently used by AggieAir at Utah State University. Give it a try and give us any feedback and ask questions on paparazzi gitter channel, or via paparazzi mailing list. The Disco from Parrot is a fixed-wing aircraft designed for FPV with all the feature already available on their Bebop2, plus some extra things, like airspeed sensor, SBUS input and PWM outputs. The autopilot itself is all integrated in a box called C.H.U.C.K. and it allows nice and easy flights with the SkyController2 and the Cockpitglasses, connected via Wifi. Special thanks to ArduPilot and Andrew Tridgell who implemented the driver for PWM output on this plane and his tips for debugging the Paparazzi version. DELFTACOPTER, an electric, long range, transitioning autonomous delta-wing helicopter, is on a mission. What mission? In this case, it’s the 2016 Outback Medical Express challenge and the MAVLab Team at TUDelft has high hopes for their hybrid aircraft. This year’s Outback Medical Express mission requires a UAV to pick up and bring back a blood sample of an ill-fated person called “Outback Joe” located at an inaccessible roughly known location 30 kilometer away remote location with unknown terrain. Powered by PaparazziUAV, the DELFTACOPTER is also equipped with state of the art on-board stereoscopic wide field of view computer vision. 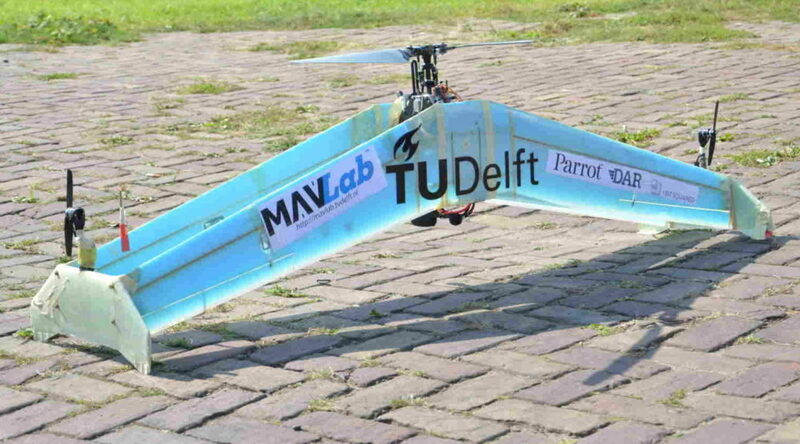 All the best to the MAVLab Team and their DELFTACOPTER during their Outback Challenge adventures. Some time ago, I found my old Game Boy at my parents’ house. So the first thing that came to my mind was: can I fly a drone with this ? (and also where is my Mario Bros cartridge). So I spend some time searching the web to see if I could find some idea to solve my problem. 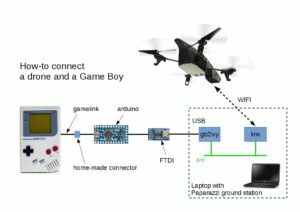 And if it seems that piloting unmanned aircraft with a Game Boy is not so common, you can find everything you need to program it! 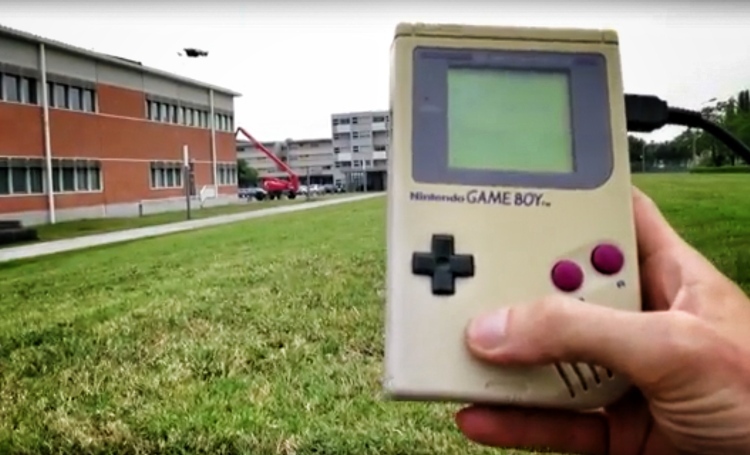 Finally, the Game Boy is just sending the bitmask corresponding to the buttons being pressed (with an Arduino and a FTDI to convert Game Link signals to USB), and a small program on the ground station converts this into actual commands for the drone (an ARDrone2 from Parrot with an extra GPS in my case). See https://github.com/enacuavlab/PPRZonGB for more information and source code of this demo. For those of us that use Paparazzi to fly multiple MAVs, the current GCS does a great job of managing and presenting just the right amount of information for safe flight. That being said, there’s always room for new tools. It’s my pleasure to introduce the Flying Robot Commander, a PPRZLINK enabled web application for managing multiple MAVs. 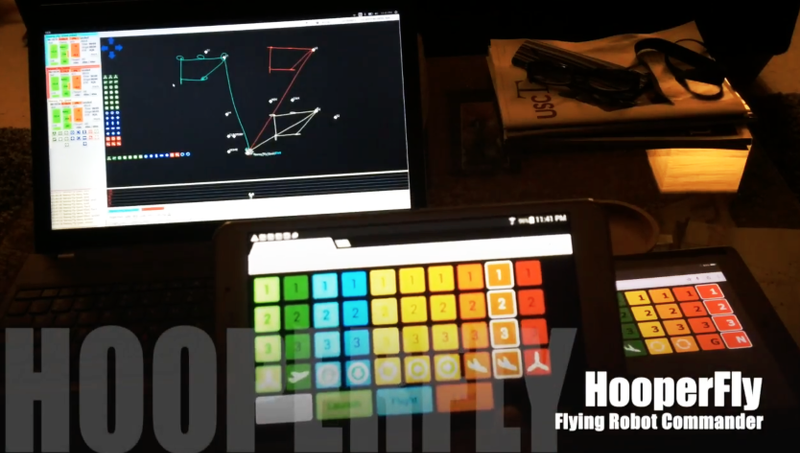 The Flying Robot Commander(FRC) is a Flask/python based RESTful web application that integrates with Paparazzi UAV via PPRZLINK. That’s right, you can now write python code to access/extend Paparazzi UAV capabilities (NOTE: one of the main complaints about the current Paparazzi GCS is that it’s written in ocaml). In addition to python, PPRZLINK also provides C and ocaml libraries for those that need them. Today we are happy to announce we’ll be adding an extra autopilot board to there long list of supported autopilots. The Pixhawk autopilot board will be integrated in our next software release! 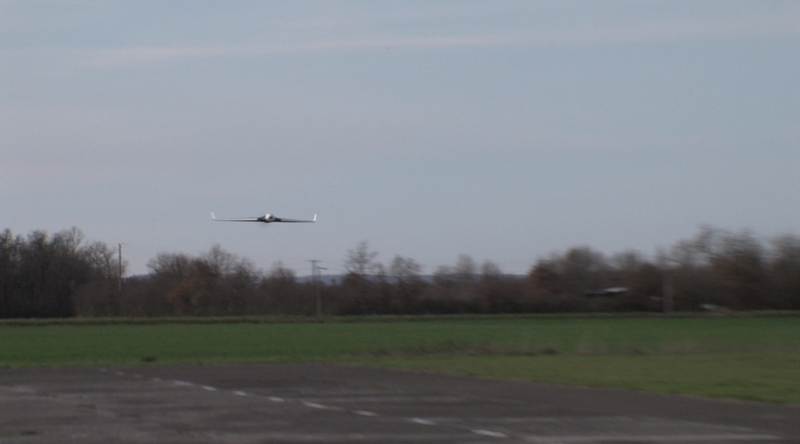 The video shows the first flight with Paparazzi UAV on a Pixhawk, more videos will follow. If you are looking for an advanced, modular open-source autopilot which has features others can only dream of, you choose Paparazzi UAV. We make it possible for you to choose the best software for your needs, on the hardware platforms that are right for your project. We are happy to announce the release of Paparazzi; v5.8, providing you with lots of new features and improvements!